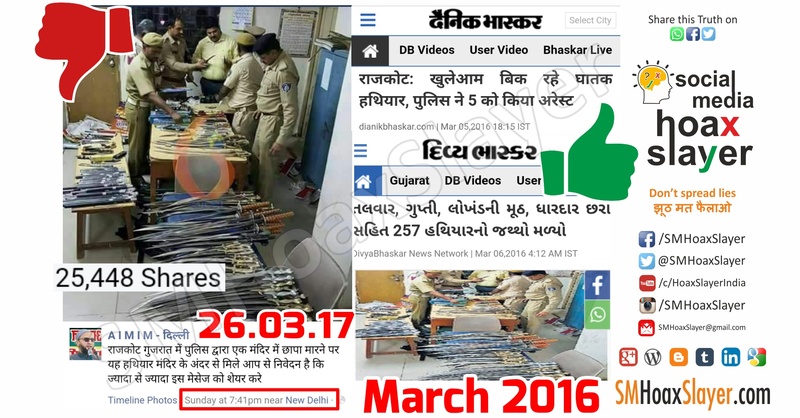 Did Police recently find a weapons in a Temple in Rajkot ? Check the truth. Did Police recently find a lot of arms in a Temple in Rajkot ? Check the truth. This photo is among a group of few which has been spreading since an year. People add caption as per their need, some say these arms were found in a Temple/Mandir, some said the lot was found in Mosque/Masjid. The truth it, this lot was caught being sold at a Hotel on Rajkot-Ahmedabad highway. Here, in this case, it was posted by AIMIM and 26000 people already believed in it, thought it to be true and shared which actually results in communal Tension, riots. ” The Rajkot detection of crime branch (DCB) and Kuvadava Road police busted an illegal weapons racket that was being operated from a hotel near Kuchiyadad village of Chotila on Rajkot-Ahmedabad highway and arrested five persons. They also seized 257 lethal weapons including swords, and knives from the hotel. According to police, they had received information that some persons were illegally selling deadly weapons like swords and knives at India Palace Hotel on Rajkot-Ahmedabad highway. So they raided the place and confiscated the weapons. “We have seized 257 weapons including swords, knives, base balls and arrested five persons including hotel owner Arif Karbali,” said a police official. Besides Karbali, those arrested include Irfan Dilawar Divan, Izrish Dilawar Divan, Ramzan Dilawar Diwan and Safi Baig Mirza. ← Two Indian soldiers sitting on a twig defying Physics? When media serve you lies for TRP ! Delivery at the age of 101 Years is shocking & fake. Did Delhi CM Kejriwal visit Islamabad to congratulate Imran Khan ? July 28, 2018 Hoax Slayer Comments Off on Did Delhi CM Kejriwal visit Islamabad to congratulate Imran Khan ? Great post! Thanks for sharing this post. Amazing post! you are a good writer. Amazing post! Thanks for sharing this useful information.